Airtrain is the sole-rail provider from Brisbane Airport to the City. We are a privately owned railway that partners with Queensland Rail and Translink to provide an integrated transport network. I am the Marketing and Sales Manager, in this role I manage the development and execution of our annual marketing strategy. 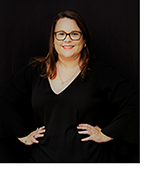 I am in charge of the marketing, sales, website, communications, customer journey touchpoints, partnerships and major event promotions for Brisbane and the Gold Coast. There are 70 people who work directly or indirectly for Airtrain. My favourite place at the moment is the Emporium South Bank roof, it has a great view of the evolving Brisbane landscape. That I am passionate about Airtrain being a key link to Brisbane City and all the events and opportunities Brisbane has to offer both as a local and a tourist. We have launched a brand new website on November 21, check it out at www.airtrain.com.au! That it is important to share your journey with others, we often only see the result not necessarily the effort it takes to get there. I am a Young Tourism Leader Ambassador for the Queensland Government and really want young people to see Brisbane and specifically Tourism as a great career option. I am inspired by so many people around me, the vibrancy of Brisbane and South East Queensland and mostly the desire to really help people enjoy their holidays.